Tucked away in Santa Rosa Beach, FL is a beautiful little community known as Seaside. There are so many treasures in this community including amazing boutiques, salons, and some incredible places to eat. Great Southern Cafe offers a variety of food choices including the most mouth-watering gouda grits and a full bar with very friendly service. This is a very family friendly vacation spot and there are bicycle rentals to tour the beachside community on. While visiting this area I would highly recommend spending some time on some of the most breathtaking beaches that Florida has to offer. This is a perfect spot for wedding venues as well, offering a quaint little chapel encased with historic trees and beautiful architecture. Everything you need is within walking distance. Over the last 11 years, I have been photographing babies and families in Seaside. I love walking around town square. It is the perfect spot for senior photos and family pictures. The white fences and coastal houses create a one of a kind backdrop. Seaside also has amazing pockets of flowers! I love searching for these little spots for baby pictures, or maternity photos. But of course, the best scenery around is right on Seaside beach. We have the prettiest white sand and the most amazing sky. perfect for your family beach photos, or any wedding, or portrait session. Sunrise at Seaside Beach Florida is my happy place. The light is amazing, and the temperature is 20 degrees cooler. So it’s a great option to keep in mind for your beach portraits. Sunset on 30a is defiantly the second favorite. 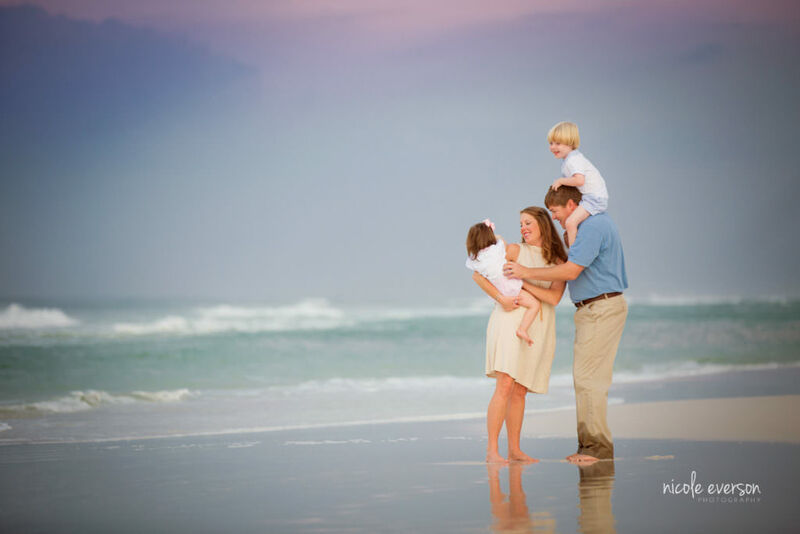 The warm light and stunning beach sunsets make the perfect backdrop for any family beach photos. Come view what past clients have to say about their photography experience. shhhhh don’t tell all the other little towns along 30a but Seaside is my favorite. I love the down to earth feel of this amazing little community. And let’s be real Seaside has the BEST smoothie joint! I first came to seaside back in 2009 when a family on vacation hired me to photograph their family on the beach. it did not take me long to see that this little town was special. When you drive into Seaside you park your car and step into a different world. a world that does not require watches, but uses the sun to tell you what time of the day it is. Seaside Florida is one of my favorite locations for senior photos. this adorable coastal town on 30A is full of so many nooks and crannies that make the perfect backdrop for senior photography. I love to start portrait sessions around town and then finishing up every session on the beach. The Emerald Coast of Florida is known for its breathtaking emerald green ocean, and white sandy beaches. Pair this with the best sunsets in Florida and you can see why it is a beach photographers paradise.